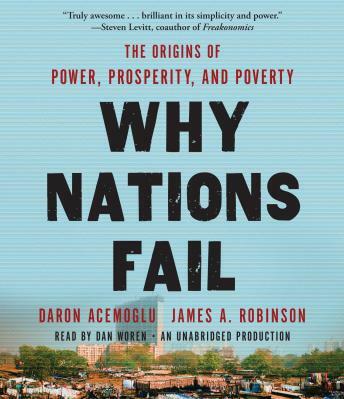 Listen to "Why Nations Fail: The Origins of Power, Prosperity, and Poverty" on your iOS and Android device. Wow? What a resourceful book on almost every nation in the world. The stories were real, interesting and extremely helpful to guide us to the causes of power, prosperity and poverty. A must read by everyone. Instead of blaming here and there, this and that, read this book and get your facts straight!! Between inclusive and extractive institutions, virtuous and vicious circles, I learned A LOT. Thank you authors. It was extraordinary in every dimension. Very informative but some of it is repetitive and can drag during certain periods. Good for academics and those interested in studying macroeconomics.